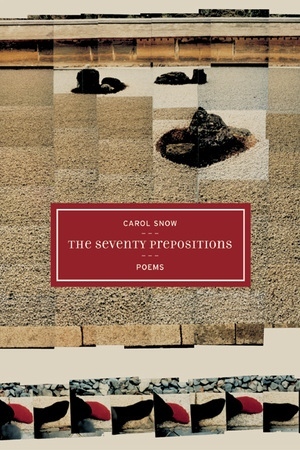 Carol Snow's award-winning poetry has been admired and celebrated as "work of difficult beauty" (Robert Hass), "ever restless, ever re-framing the frame of reference" (Boston Review), teaching us "how brutally self-transforming a verbal action can be when undertaken in good faith" (Jorie Graham). In this, her third volume, Snow continues to mine the language to its most mysterious depths and to explore the possibilities its meanings and mechanics hold for definition, transformation, and emotional truth. These poems place us before, and in, language--as we stand before, and in, the world. The Seventy Prepositions comprises three suites of poems. The first, "Vocabulary Sentences," reflects on words and reality by taking as a formal motif the sort of sentences used to test vocabulary skills in elementary school. The poems of the second suite, "Vantage," gather loosely around questions of perspective and perception. The closing suite finds its inspiration in the Japanese dry-landscape gardens known as karesansui, such as the famous rock garden at Ryoan-ji Temple in Kyoto. Here the poet approaches composition as one faces a "miniature Zen garden," choosing and positioning words rather than stones, formally, precisely, evocatively. Carol Snow is Codirector of the Blue Bear School of American Music in San Francisco. She is the author of Artist and Model (1990), which received the 1990 Book Award from the Poetry Center at San Francisco State University, and For (California, 2000).